Passenger Cars « Global Market Insights, Inc. The growing prominence of low-emission & high-performance engines is projected to fuel automotive part cleaners & degreasers industry in the forthcoming years, owing to the rising significance imparted to maintenance and servicing operations. The array of products that are available across this domain are frequently used to rid the vehicle’s engine of different contaminants before an oil change in an effort to enhance the vehicle’s fuel efficiency. Moreover, with global vehicle sales growing at an exponential rate owing to improving economic conditions across a number of countries, the automotive part cleaners & degreasers market is expected to accumulate substantial momentum from their maintenance & servicing activities. Furthermore, there has been a growing trend for the sale of vehicle part & repair accessories online as more and more brands are starting to make their products available on global e-commerce platforms. While improving economic conditions have propelled vehicle sales across the world, they have also fueled the sizable boom the construction & e-commerce industries which in turn have driven up the commercial & heavy vehicle demands, further propelling the automotive part cleaners & degreasers industry trends. Defying previous predictions, the sales of vehicles across the United States in 2018 experienced a slight rise in its numbers, highlighting the nation’s strong economy with automobile manufacturers reporting a 0.3% surge to approximately over 17 million vehicles. This rise in sales comes despite a highly-volatile stock market, growing interest rates, and increasing vehicle prices that have pushed some of the prospective buyers out of the automobile market. This tendency for the U.S. vehicle market to draw in growth in the face of adverse market conditions would be responsible for driving the growth of the regional automotive part cleaners & degreasers industry, specifically from the sales of engine flush cleaner, on account of the fact that they impart efficiency and longevity to engines that is crucial for the U.S. auto industry. As a matter of fact, across the United States, owning a vehicle is extremely critical since vehicles are viewed from a utilitarian perspective. Due to scarce options of public transport, a majority of the nation’s population depends on automobiles to commute to & from work – that is to say, an average U.S. automobile experiences extensive amount of use throughout its tenure. This has driven the demand for engine flush cleaners that help elongate the shelf life of engines, by eliminating deposits, gum, and varnish, and improving fuel performance. Powered by the requirement of a clean lubrication system and the stringent norms governing VOC emissions, the U.S. automotive part cleaners & degreasers industry share from engine flush cleaners is anticipated to register a CAGR of 2.5% over 2018-2024. According to U.S-based non-profit organization, Manufacturers of Emission Controls Association (MECA), catalytic converters have been an extremely important aspect of mobile-source emission control across the world ever since the mid-1970s. Catalytic converters, from the initial two-way oxidation units to the advanced three-way units that are used today, have helped in cutting down air pollution by more than 10-billion-tons across the U.S. alone. Today, advanced catalytic converters are more crucial than ever due to the increasing need globally to cut down on carbon emissions and manufacture more fuel-efficient & eco-friendly vehicles, which in consequence has surged the demand for catalytic converter cleaners worldwide. These cleaners, while helping to cut down on emissions also help improve fuel-efficiency & ensure vehicle safety by preventing the clogging of catalytic converters. 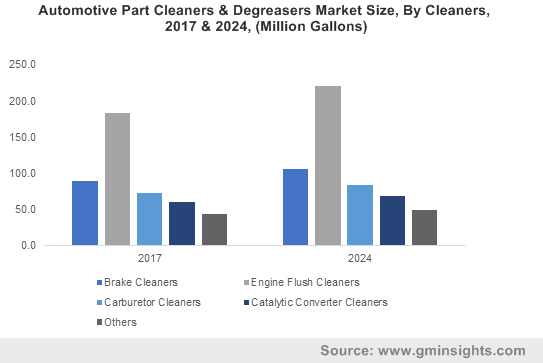 Attributing to these prominent factors, automotive part cleaners & degreasers industry size from catalytic converter cleaners had been pegged at $2.5 billion in 2017. 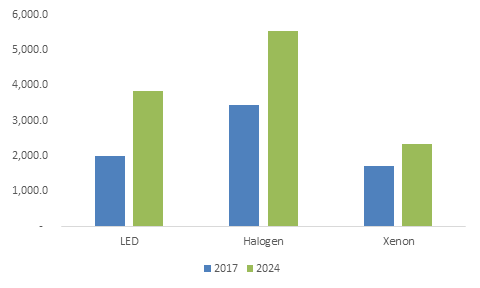 The industry would also experience momentum due to increasing government regulations concerning the rate of emissions and the rising investments that automakers are making in their respective R&D activities to control emissions. China’s rapidly rising standard of living and purchasing power have majorly propelled the region’s automotive industry, consequently driving the demand for maintenance and servicing products. As per reports, the region has observed exceptional sales of transmission degreasers, that are suitably designed to break down varnish deposits and clean internal transmission components. In a bid to ensure passenger safety and prevent damage, auto maintenance and repair establishments are found to be using these degreasers consistently. China automotive part cleaners & degreasers industry size from transmission degreasers apparently, is anticipated to be pegged at $1 billion by 2024. Transmission degreasers are also known to maintain optimal gearbox conditions and enhance vehicle speed. In order to cater to the consumer demands for excellent vehicle performance, longevity, regular servicing, and leakage elimination, servicing setups are often found using transmission degreasers, that would further augment the industry growth in the region. This entry was posted in Bulk & Specialty Chemicals and tagged Automotive Part Cleaners & Degreasers Market, Automotive Part Cleaners & Degreasers Market Size, Brake Cleaners, Carburetor Cleaners, Catalytic Converter Cleaners, Engine Degreasers, Engine Flush Cleaners, Exhaust Parts Degreasers, Global Automotive Part Cleaners & Degreasers Market, Heavy Commercial Vehicles, Light Commercial vehicles, Passenger Cars, Solvent-Based, Transmission Degreasers, Two-Wheelers, Water-Based. With the automotive industry adhering increased importance to the driver’s comfort and convenience, steering wheel switches market is projected to witness massive growth in the years ahead, in terms of sales and volume. Traditionally, these wheels were designed only with one button for honking, however, with consumers demanding increased functionality in the car such as controls for playing music and handsfree talking on the phone, steering wheels have come to include more switches that can help the driver operate different functions without having to get distracted from driving, thus helping to prevent accidents. Steering wheel switches are more prevalent in passenger vehicles and light commercial vehicles, though they are also gaining prominence in heavy commercial vehicles. Owing to the comfort and functionality that these switches provide, automotive industry players are looking forward to incorporating more such switches in the steering wheel with varied styles, which would eventually boost steering wheel switches industry trends. It is imperative to mention that in the countries where the demand for luxury cars are greater, such as Germany, Italy, UK, US and France, steering wheel switches industry giants have designed wheels to accommodate as many as 10 switches. This trend has been followed in mid-range cars as well, with switches like infotainment, phone connectivity and volume control that can keep drivers from operating the distracting touchscreen for any kind of function control. Many auto manufacturers are also adding a joystick-like push button controller on the left of the steering wheel, which is intuitive and can be operated without the driver having to seek out the touchscreen display first. The rising demand for such easily functional switches will indeed boost the steering wheel switches market share. Many automobile designers and manufacturers are also working to design a uniform steering wheel switch layout so that it is easier for users to operate controls using intuition and feel, thereby propelling the steering wheel switches industry further. Elaborating further on the design, it is prudent to state that steering wheel switches market size will grow at a CAGR of 3% over 2017-2024 from the OEM segment, as original equipment manufacturers are able to offer unique and customized designs for steering wheel switches that are amply suited to the customer’s specific desires. Also, OEMs have greater capacity for investing heavily in innovation that would lead to better steering wheel designs. The high costs associated with steering wheels designed by OEMs will also drive the aftermarket steering wheel switches industry, estimated to be worth $600 million by 2024. Aftermarket steering wheel switches are easier to afford and incorporate into the existing design of the vehicle. The consumer also gets a wider choice of what to incorporate and what to avoid when steering wheel switches are purchased and installed through the aftermarket. Widespread presence of the e-commerce industry and easy availability of the product in online auto stores will further drive the aftermarket steering wheel switches industry. Considering the fact that they ensure driver’s safety, steering wheel switches might be made mandatory in the near future. The ease of operation the product provides is also a reason for the rising popularity and demand of steering wheel switches. Automotive manufacturers in the rapidly developing region of Asia Pacific have duly acknowledged this growing demand. Driven by the massive increase in automotive manufacturing and sales in this region, APAC will contribute over 40% toward steering wheel switches industry share by 2024. 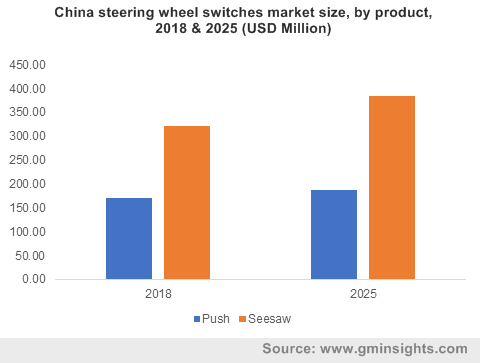 Though the growth prospects of steering wheel switches market are indeed impressive, it is expected that the emergence of autonomous vehicles technology and innovative cars that may come without steering wheels may hinder the steering wheel switches market progress. Nonetheless, it has been forecast that driverless cars would take a while to go mainstream, on the grounds of which it is justified to state that steering wheel switches market would continue to experience an exponential growth graph in the ensuing years. This entry was posted in Automotive & Transportation and tagged Aftermarket, HCV, Heavy Commercial Vehicles, LCV, Light Commercial vehicles, OEM, Passenger Cars, PCV, Push, Seesaw, Steering Wheel Switch, Steering Wheel Switches Market, Steering Wheel Switches Market Share, Steering Wheel Switches Market Size. The escalating development of global automotive sector will generate lucrative growth avenues for automotive wheel market. Automobile producers have been adopting new manufacturing techniques to comply with emission control regulatory norms. Researchers have also been implementing novel product designs and improvised concepts to increase the fuel efficiency of vehicles, which in turn, will boost automotive wheel industry size. Rising spending capabilities of consumers across the globe is also fueling the product demand. Of late, consumers have been prioritizing comfort, durability, and product design, which will provide a significant impetus to global automotive wheel industry. In fact, estimates claim automotive wheel market to surpass USD 100 billion in terms of revenue by the end of the year 2024. Major automotive manufacturers across North America and Europe are treading towards the production of lightweight vehicles, owing to the increasing concerns over environmental pollution. Aluminum is one of many materials that is used to construct these light weight vehicles, and has also been gaining popularity pertaining to the benefits it provides such as low weight, improved design, and excellent performance. 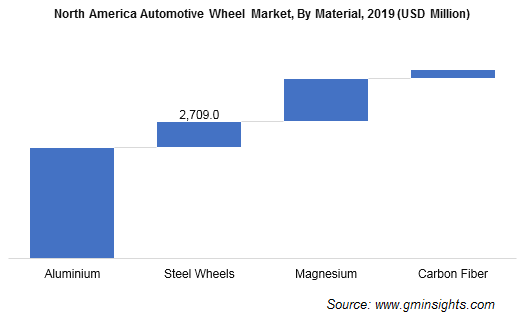 The aluminum-based automotive wheel market will also experience commendable growth in the ensuing years pertaining to enhanced car handling and riding comfort, in tandem with the reduction of unsprung mass. Surging innovations in product design has generated lucrative opportunities for various OEMs to penetrate automotive wheel market. In fact, OEMs dominated the automotive wheel market in 2017 and the segment is anticipated to retain its dominant position over 2018-2024 as well. The growth in the demand for OEMs in this industry can be appropriately credited to the extended durability, robust performance irrespective of weather, and reduced replacement rates. It is prudent to mention that OEMs have also benefitted from supportive manufacturing policies implemented by numerous Asian countries. The Asian zone, as a matter of fact, is anticipated to garner substantial returns in automotive wheel market, particularly on account of the expanding automotive industry in the region and the extensive automobile production across the economies of China and India. Indeed, APAC is known to have been a dominant regional contender and is expected to continue its leadership streak in the global automotive wheel market over 2018-2024. The regional growth can also be credited to the hefty demand for aluminum wheels in passenger cars in tandem with the requirement for aftermarket customization. Rapid urbanization trends across the globe have changed the consumer standards of living, on account of which consumers across the globe have been giving preferences to passenger cars. 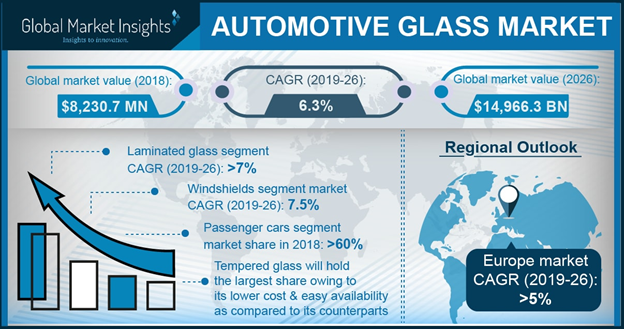 Driven by rising passenger cars sales subject to increasing disposable income and high demand for mobility, automotive wheel industry size from passenger cars is likely to depict an incline in the years ahead. In 2018 alone, the European Automobile Manufacturers’ Association (ACEA) observed registrations of about 12 million passenger cars, with a growth rate of 2.5% between January-September 2018. Even in China, in 2016, passenger car production was recorded at more than 24 million units. 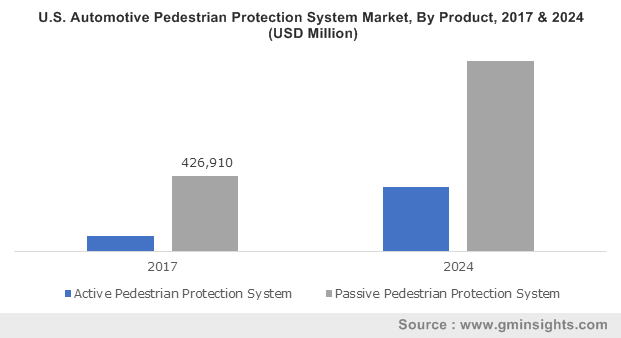 It is thus rather overt from these statistics that the commercialization scale of the global automotive wheel market will experience quite an upsurge from the worldwide demand and supply of passenger cars alone. 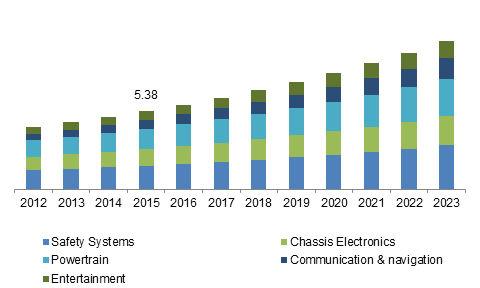 OEMs, in recent times, have been making strategic agreements with suppliers to expand the business space. Innovations in product design and manufacturing processes will create numerous growth opportunities for industry players in automotive wheel market. Mergers & acquisitions and joint ventures will continue to remain the key growth strategies that major companies will adopt, in order to stay ahead of their rivals in automotive wheel market. This entry was posted in Automotive & Transportation and tagged Aftermarket, Aluminum, Automotive Wheel Market, Automotive Wheel Market Size, Buses, Carbon Fiber, Coaches, Global Automotive Wheel Market, Heavy Trucks, High Performance, Light Commercial vehicles, Magnesium, OEM, Passenger Cars, Regular, Steel, Trailers.